We can hardly believe that what started out as a few fun cooking tutorials on YouTube has turned into a proper grown up cookbook. An actual printed, fully photographed, bound collection of our recipes! It was our baby for over a year and the first time we held it in our arms was truly like holding a newborn. Only you can eat what’s inside it, if you knock a few pans about in the kitchen. See the list below for places where you can get your hands on a copy of The Dumpling Sisters Cookbook. There are options aplenty! 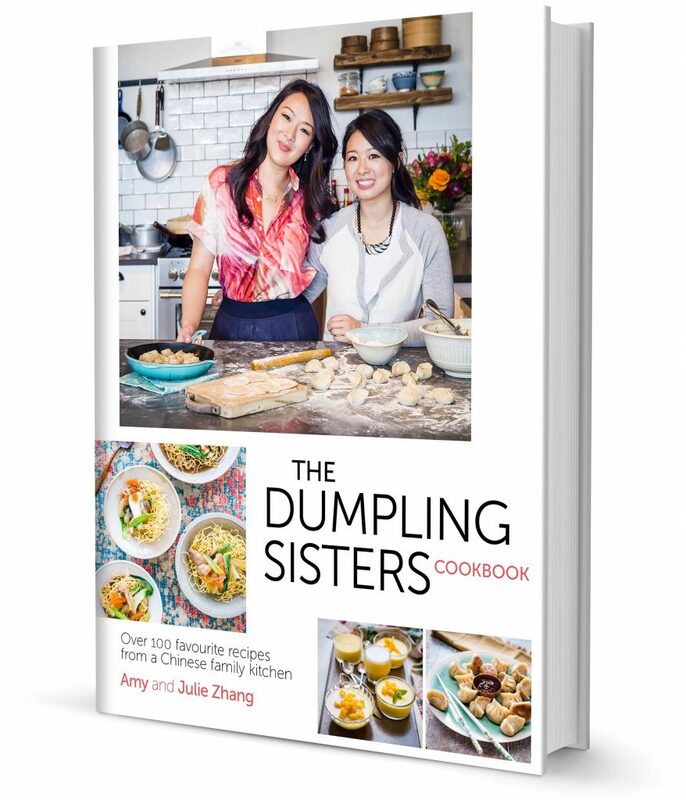 Amy and Julie Zhang have been entertaining and educating their thousands of followers on Youtube with their recipes for deliciously easy homemade Chinese food – now THE DUMPLING SISTERS CHINESE COOKBOOK brings you more of the recipes and advice that those fans have been clamouring for. Dedicated to and destined to be adored by every Chinese food lover, this book is full of Chinese-food favourites, impressive sharing dishes and even sweet treats that have been little acknowledged in a western understanding of Chinese food – until now. This is Chinese home cooking at its best. The recipes are structured as to give a gradual introduction to Chinese dishes, beginning with the simple; Best Ever Fried Rice, and working up to the more elaborate Cracking Five-Spice Roast Pork Belly, and are interspersed with the insider tips and tricks that the girls’ Youtube fans adore. There is also a focus on Chinese culture and eating etiquette (for perfecting those chopstick skills), including sharing menu planner and a guide to shopping at the Chinese supermarket. Amy and Julie write with wit and gusto – they are the perfect cooks to take any food lover on a journey to discover real Chinese cooking. The Dumpling Sisters are an engaging and charismatic duo who have referred to themselves as the ‘young, Asian, and (much) less hairy Hairy Bikers’. They are exceptionally bright girls; Amy has a PhD in science and Julie has a masters in psychology and criminology, with a passion for cooking. The Zhang family is from Guangzhou in China, a city famed for its incredible Cantonese cuisine. After moving to New Zealand the family set up a Chinese food cart which was as a family – giving Amy and Julie invaluable experience of cooking Chinese food to the highest standards. In 2014 the food cart is still going strong.